Tertullian (2nd century) uses processio and procedere in the sense of to go out, appear in public, and, as applied to a church function, processio was first used in the same way as collecta, i.e. for the assembly of the people in a church. In this sense it appears to be used by Pope Leo I, while in the version by Dionysius Exiguus of the 17th canon of the Council of Laodicea (about 363–364) Ancient Greek: σονάξεσι, is translated by processionibus. Very early were the processions accompanied by hymns and prayers, known as litaniae, rogationes or supplicationes. It is to such a procession that reference appears to be made in a letter of St Basil, which would thus be the first recorded mention of a public Christian procession. The first mention for the Western Church occurs in St Ambrose. In both these cases the litanies are stated to have been long in use. There is also mention of a procession accompanied by hymns, organized at Constantinople by St John Chrysostom (c. 390-400) in opposition to a procession of Arians, in Sozomen. In times of calamity litanies were held, in which the people walked in robes of penitence, fasting, barefooted, and, in later times, frequently dressed in black (litaniae nigrae). 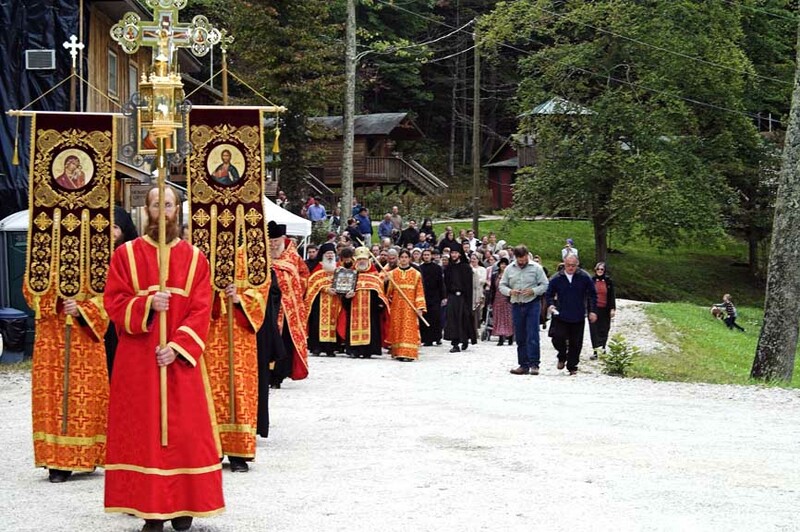 The cross was carried at the head of the procession and often the gospel and the relics of the saint were carried. 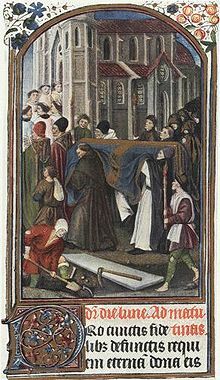 Gregory of Tours gives numerous instances of such litanies in time of calamity; thus he describes a procession of the clergy and people round the city, in which relics of St Remigius were carried and litanies chanted in order to avert the plague. So, too, Gregory the Great writes to the Sicilian bishops to hold processions to prevent a threatened invasion of Sicily. A famous instance of these penitential litanies is the litania septiformis ordered by Gregory the Great in the year 590, when Rome had been inundated and pestilence had followed. Edo-period documenters enjoyed drawing the processions of pleasure district beauties, such as Courtesan Parading With Attendants by Suzuki Harunobu. Similar parading courtesans feature in Cherry Blossom in the Evening on the Nakanomachi in Yoshiwara by Utagawa Hiroshige and True Scenery of the Gay Quarter of Minatozakimachi Shinminato by Utagawa Sadahide. The Lord Mayor's Show in London has long featured displays by the city's official trade guilds. Parades were at one time important advertisement when a traveling circus arrived in a new town. Today, many parades in the United States are sponsored by department stores, such as Macy's, which expect the public spectacle to lure shoppers to the store. Graduation procession of King's College London, one of the founding colleges of the University of London, showcasing the academic dresses created by globally-renowned[opinion] fashion designer Vivienne Westwood during the Summer 2008 graduation. The Procession Path (Lat. ambitus templi) is the route taken by processions on solemn days in large churches—up the north aisle, round behind the high altar, down the south aisle, and then up the centre of the nave. Procession of the Holy Blood in Bruges, annual Procession. Semana santa in Sevilla, Royal archbrotherhood of "La Carretería". 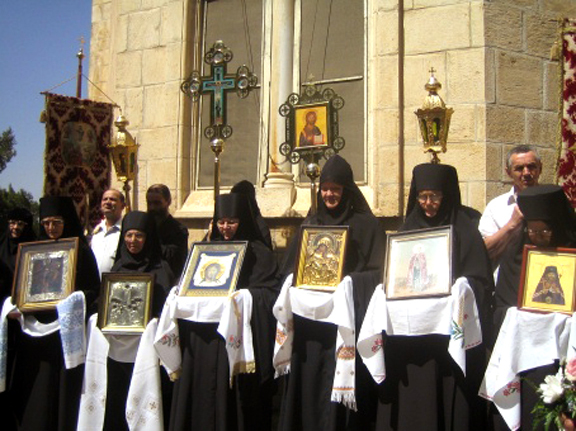 ^ In some traditions, a procession takes place on Palm Sunday as well. ^ A similar procession takes place sundry other times when the Lesser Blessing of Waters is performed. One or more of the preceding sentences incorporates text from a publication now in the public domain: Chisholm, Hugh, ed. (1911). "Procession" . Encyclopædia Britannica. 22 (11th ed.). Cambridge University Press. pp. 414–416. ^ Daremberg and Saglio, Dictionnaire des Antiquités Grecques et Romaines, s.v. Consul. ^ See Preller, Rm. Mythologie, pp. 370-372. ^ Ep. IX. ad Diosc. episc. c. 445: qui nostris processionibus et ordinationibus frequenter interfuit. ^ Smith, Dic. of Class. Antiq. s.v. Procession. ^ See Louis Duchesne, Origines, 2nd ed., pp. 77, 154, 181; 78, 194. ^ c. 388, Ep. 40 16, Ad Theodos. monachos ... qui psalmos canentes ex consuetudine usuque veteri pergebant ad celebritatem Machabaeorum martyrum. ^ Hist. eccl. viii. 8. ^ Vita S. Remig. I. ^ See Gregory of Tours, Hist. Fr. x. i, and Johann. Diac. Vita Greg. Magn. i. 42. ^ See e.g. St Ambrose, Ep. 29 and St Augustine, De civitate Dei, xxii. 8 and Conf. viii. 7, for the finding and translation of the relics of Saints Gervasius and Protasius. ^ Alte Bittgange, in Zeller, Philosophische Aufsatze, p. 278 seq. ^ Fasti praenestini, C.T.L.T., p. 317. This article incorporates text from a publication now in the public domain: Chisholm, Hugh, ed. (1911). "Procession Path" . Encyclopædia Britannica. 22 (11th ed.). Cambridge University Press. p. 417.